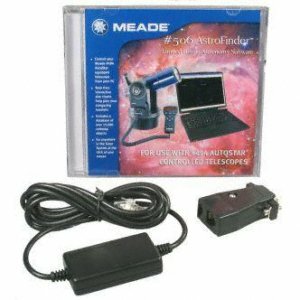 The Meade #506 Astrofinder software allows you to remotely control your #494 Autostar-equipped ETX70AT or ETX80AT telescope from a laptop or PC. It displays a real-time interactive star chart on your computer screen that constantly shows you where your scope is pointing, so you can locate targets of opportunity while scanning the skies. You can use it to remotely slew the scope to any object, both inside and outside the solar system, at a click of your mouse. You can also use the program indoors when the weather is bad to plan future observing sessions and to print star charts to help organize your observing sessions in advance. It will display realistic planetarium-style views of the sky and earth on your monitor to help you learn the skies when the skies are too cloudy to see the skies. The program comes on a CD-ROM and includes over 15,000 stars and objects in its database. It requires a PC running Windows 98SE through Windows XP. It will not run under Windows 95 or earlier, nor will it run under Windows Vista. System requirements include a Pentium CPU IBM-PC/AT or faster processor, a CD-ROM drive, 64 megabytes of RAM, an SVGA or better monitor that’s 256-color capable, and 200 megabytes of hard drive space (depending on how much of the database you want to keep on the drive to avoid having to use the CD-ROM in the field). A #505 connector cable set is included with the #506 Astrofinder package and does not have to be purchased separately to use the software. The #505 cable set consists of a 6’ cable, plus a DB-9 serial adapter that lets you connect your scope to your laptop or PC to control the scope.